Wash, de-stem and chop the kale. Set aside in a large salad bowl. Make the dressing and massage it onto the kale. This will help soften the kale leaves and you will get a more flavorful salad. Wash and dice the strawberries and add them to the salad. Let sit for about 30 minutes to let the flavors combine together. Tender pieces of kale sautéed with garlic and onions add a nice twist to this simple chicken burrito. Rich in iron and vitamins A, C and E, kale is among the healthiest of greens. In this surprisingly hearty salad, raw leaves are wilted with a pinch of salt. Perfect as a vegetarian side dish, this easy-to-make stir-fry is ready in under 20 minutes. 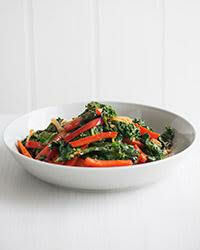 Colorful and delicious, this stir-fry recipe with loaded with red bell peppers and healthy kale. Simple chicken soup becomes extra special with healthy kale and a squeeze of fresh lemon juice.